Whether you need to screen a perpetrator at a crime scene or your agency simply needs to conduct regular and/or random testing on employees or clients, Sirchie is here to make your task efficient and easy. 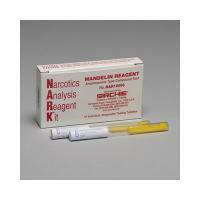 The NARK Mandelin Reagent is a general screening for amphetamines that will help focus the testing process and determine which presumptive field test to use next, if any. NARK Mandolin tests for Methadone, Amphetamines, and Methamphetamines. If the Reagent reacts, you can then choose from Sirchie's tests for one of these specific drugs. These tests come packaged 10 to a box so you'll always have a supply at the ready.